The Land Pride RTA12 Series Rotary Tillers till soil for seedbed or planting preparation and have uses in applications such as residential landscaping and gardening. The offset capabilities allow the tiller to work closer to objects such as fence lines, buildings, or trees. Operator can control the tilling depth with the adjustable skid shoes. A 15" rotor swing diameter turns the soil over faster, and enables deep tilling action. American made: American made means better parts availability. Many tillers are imported. 3 Year Gearbox Warranty: 3 Years on housings, seals, bearings. Shows our confidence in the product. 6 1/2” Digging depth: For deep soil penetration. Formed plate steel upper hitch: Plate steel is stronger than flat bar type hitch. Clevis lower hitch: Provides additional strength and easy one person hook-up. Hitch sideshift capabilities (See Specifications for dimensions): Sideshift tiller to cover right tire track. Gearbox slides with tiller. Offset Capabilities: Allows tiller to work closer to objects such as fence lines, buildings and trees. 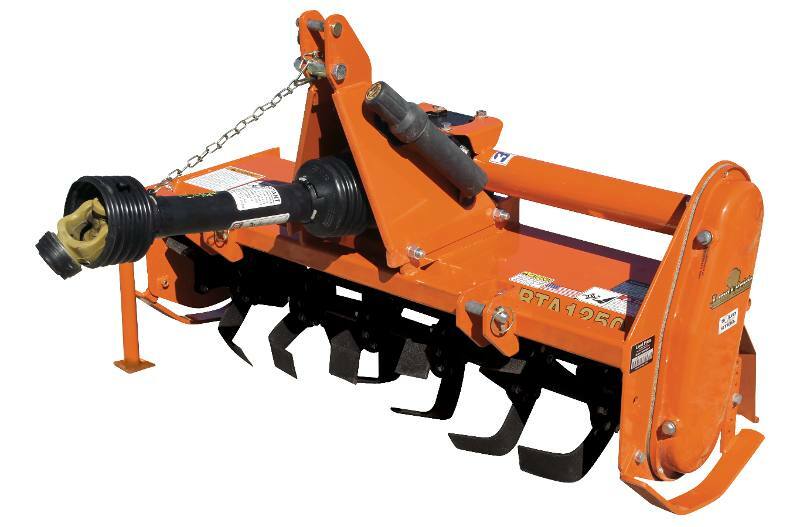 Fits Land Pride Quick-Hitch: Allows for quick and easy one person hook-up. Does not offset to the left with Quick-Hitch. Adjustable Parking stand: Allows for easy hook-up and storage. Adjustable skid shoes: Control depth with various settings. Formed and reinforced rear deflector: Forming gives deflector additional strength. Adjustable deflector allows for various finish results. 4 ‘C’ Shaped heat-treated tines per flange: ‘C’ Shaped tines require less HP to move through the ground. Solid steel rotor shaft: Solid steel shaft gives rotor extra strength. 15” Rotor swing diameter: For deep tilling and turning the soil over faster. Double lip seal on rotor bearing: Double lip seal helps keep the dirt out and the grease in. Fully shielded slip-clutch driveline: Protects the gearbox and rotor shaft upon hitting obstructions. Slip-clutch saves having to replace shear-pins. #80 Drive chain enclosed in oil bath: Heavy drive chain stretches less, and oil bath keeps wear to a minimum. Stamped chain case cover: Stamped forming gives the chain cover strength. Width, end plate to end plate: 58"
Sideshift dimensions centered: 29" - 29"
Shifted right: 22" - 36"
Shifted left: 36" - 22"
Quick-Hitch may require a longer driveline, which is available through Land Pride Parts.